Quality control in food research is often carried out by careful evaluation of microstructural features such as holes, protein, and fat of food samples. Indeed, the microstructural arrangement of basic elements of a complex food product affects its macroscopic behaviour and properties. Microscopy combined with quantitative analysis is often used to find out the relationships between food properties and its microstructure. However, segmentation of structural features in food images is mostly carried out with time-consuming user interaction, by means of techniques as simple as thresholding and basic morphological operators. Reliable quantitative analysis of microscopic features can be automatically accomplished only if a high-quality segmentation is computed beforehand. The measurements computed on binary images are deeply influenced by the segmentation accuracy, especially when shape descriptors of features are involved. This project aims at developing high-quality segmentation algorithms for food microscopy applications, as well as advanced tools to analyse image data. G. Impoco, L. Tuminello, Incremental Learning to Segment Micrographs. In Computer Vision and Image Understanding Vol. 140, pp. 144–152, 2015 (impact factor: 1.358). N. Fucà, C. Pasta, G. Impoco, M. Caccamo, G. Licitra, Microstructural properties of milk fat globules. In International Dairy Journal Vol. 31, pp. 44-50, 2013 (impact factor: 2.181). G. Impoco, N. Fucà, C. Pasta, M. Caccamo, G. Licitra, Quantitative Analysis of Nanostructures' Shape and Distribution in Micrographs Using Image Analysis . In Computers and Electronics in Agriculture Vol. 84, pp. 26-35, 2012 (impact factor: 1.431). G. Impoco, L. Tuminello, N. Fucà, M. Caccamo, G. Licitra, Segmentation of Structural Features in Cheese Micrographs Using Pixel Statistics. In Computers and Electronics in Agriculture Vol. 79 (2), pp. 199-206, 2011 (impact factor: 1.431). 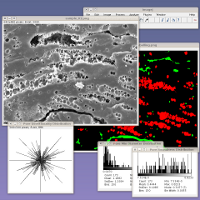 G. Impoco, Image Analysis and Microscopy in Food Science: Computer Vision and Visual Inspection. In proceedings of 16th Intl. Conference on Advanced Concepts for Intelligent Vision Systems (ACIVS 2015), Catania, Italy, October 26–29, pp. 651-660, 2015. G. Impoco, L. Tuminello, G. Licitra, Incremental Learning to Segment Micrographs. In proceedings of MDA2010, Berlin, Germany, 12 July, 2010. G. Impoco, G. Licitra, An Interactive Level Set Approach to Semi-automatic Detection of Features in Food Micrographs. In proceedings of (CAIP 2009) Computer Analysis od Images and Patterns, Münster, Germany, 2-4 September, 2009. G. Impoco, S. Carrato, M. Caccamo, L. Tuminello, G. Licitra, Quantitative Analysis of Cheese Microstructure Using SEM Imagery. In proceedings of SIMAI 2006, Minisymposium: Image Analysis Methods for Industrial Applications, Baia Samuele (RG), Italy, 22-26, May, 2006. G. Impoco, Quantitative Image Analysis in Microscopy. In Microstructure of Dairy Products, Ed. M. M. A.‐R. El‐Bakry, A. Sanchez, B. M. Mehta, pp. 89-125, John Wiley & Sons Ltd, 2018. N. Fucà, G. Impoco, G. Licitra, Milk fat globules' microstructure. In Milk fat: composition, nutritional value and health implications, Nova Science Publishers, 2013. G. Impoco, N. Fucà, G. Licitra, Quantitative image analysis of food microstructure. In Current microscopy contributions to advances in science and technology, Volume 2 (ISBN (13): 978-84-939843-6-6), Ed. A. Mendez-Vilas, pp. 903-911, Formatex Research Center, 2012.